FUEL EFFICIENT 25 MPG Hwy/19 MPG City! Audi Certified, CARFAX 1-Owner. 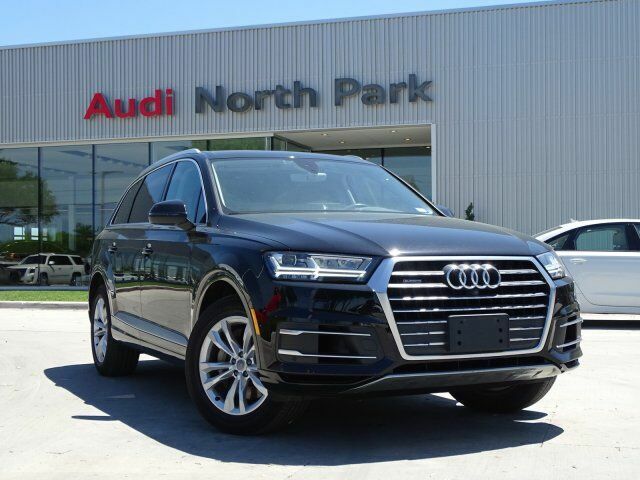 Third Row Seat, Moonroof, Navigation, Heated Leather Seats, All Wheel Drive, Trailer Hitch, Panoramic Roof, PREMIUM PLUS PACKAGE, TOWING PACKAGE READ MORE! Leather Seats, Third Row Seat, Panoramic Roof. PREMIUM PLUS PACKAGE Heated Auto-Dimming Power Folding Exterior Mirrors, Stainless Steel Trunk Sill, Audi Side Assist, rear cross traffic alert and vehicle exit assist, Electric Tilt/Telescopic Steering Column, tilt and telescopic, LED Interior Lighting Package, door insert, door inlay, contour, instrument panel contour and door pocket LED accents, Audi Advanced Key, keyless entry w/hands-free tailgate open/close and keyless start and stop, Audi MMI Navigation Plus w/MMI Touch, INRIX XD Traffic, Audi connect w/ subscription, Audi smartphone integration and MMI all-in-touch w/handwriting-recognition technology, Audi Connect CARE, limited time subscription, Audi Connect PRIME & PLUS, subscription, Audi Smartphone Integration, Apple Carplay/Android Auto, VISION PACKAGE Audi Virtual Cockpit Rear Spoiler, MP3 Player, Sunroof, All Wheel Drive, Privacy Glass, Steering Wheel Controls, Child Safety Locks.